The SERVICE DESCRIPTION consists of a Load Index and a Speed Symbol. The SPEED SYMBOL indicates the maximum speed at which the tyre can carry a load corresponding to its Load Index under service conditions specified by Avon Tyres. These speeds are shown in Table 1 and apply to tyres when in good condition, inflated to the correct pressure, operating within their specific load capacity and fitted to the correct size rim. Speeds quoted are the maximum speed of which the tyre is capable, not the speed at which it is normally ridden. V, W and Z rated tyres may also be used at higher speeds but at reduced loadings. 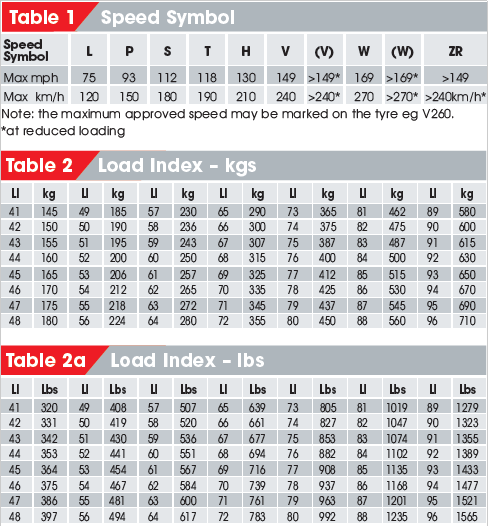 For guidance only Table 3 can be used to calculate loads at specific speeds on V, W and Z tyres. ALL MAXIMUM SPEEDS REFERRED TO ARE SUBJECT TO APPLICABLE LEGAL SPEEDS. The LOAD INDEX is a numerical code associated with the maximum load a tyre can carry (except for loads at speeds above 130 mph (210 km/h) – see Table 2/2a) at the speed indicated by its Speed Symbol under service conditions specified by Avon Tyres. You should only fit replacement tyres bearing the precise speed and load index referred to in the motorcycle manufacturer’s handbook. Before you make any variation please consult Avon Tyres to ensure that the replacement tyre is a correct fitment for your motorcycle.